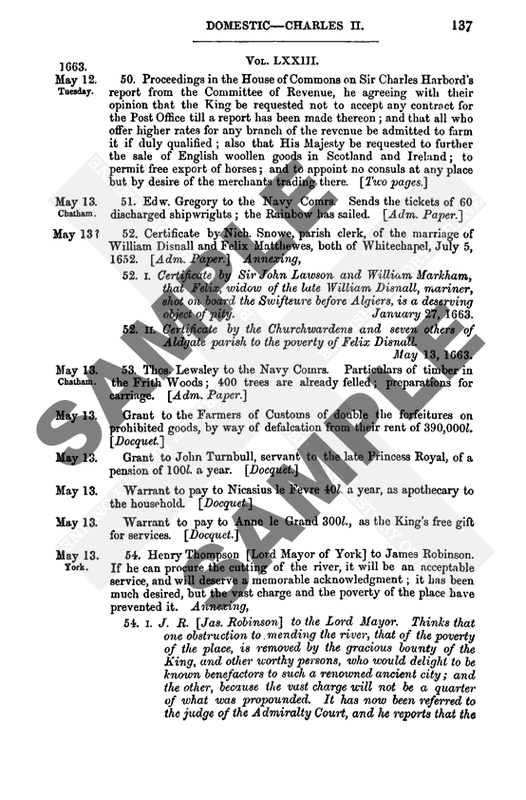 Calendar of State Papers Foreign: Elizabeth, Volume 21, Part 1, 1586-1588. Originally published by His Majesty's Stationery Office, London, 1927. Duke Casimir to the Queen. There is nothing he desires more than to have good news of the health and prosperity of her Majesty, on whom depends the safety of Christendom; expecting and hoping that she will be able to relieve and redress those affairs which tend evidently to utter desolation and ruin. Is now sending to her his counsellor, Dr. Pierre Denais, the bearer of this, to whom he prays her Majesty to give credit as to himself.—Heidelberg, 16 April, 1588. Recommending the above mentioned Dr. Denais confidently to his kindness and assistance; knowing the affection which his honour bears to himself.—Heidelberg, 16 April, 1588. The Princess of Bouillon to Walsingham. I have heard too much from my late mother and my brothers of your good will towards them to be in doubt of your regret and compassion on seeing this house made destitute in so short a time, and thus I feel assured that, from memory of them, you will compassionate me in this great loss, for solace wherein, hoping nothing more than to inherit the honour of the favour of the Queen your mistress, I pray you to assure her that she can do honour to no one more devoted to her service. And for your own part, Monsieur, do me the favour to continue to me the good will which I shall hold most dear, knowing my brother's great obligations to you—the proofs of one of which have fallen into my hands since the day when it pleased God to take him from me—which I hold as done to myself, to be requited with all the affection of my soul. Having learnt from M. de Torcay [Torcy] that you are acquainted with him, I have begged him to give you a full account of what has passed here, which it may please you to communicate to the good friends of this house; and as the bearer of this is his son, who is returning into England to dwell there, I recommend him to you as the son of a gentleman for whom I have a singular esteem, apart from the many good services which I have received from him during his banishment for the Religion, which may God preserve in this desolate place, against the will of those who put all their strength in opposition thereto.— Sedan, 27 April, 1588. His last was of the 14th inst., since when his servant has arrived with his honour's order for his return and for the receipt of 50l. sterling. Is leaving with all speed, possibly this day, for England. Feels himself highly favoured by the sending of the allowance for his charges, which are recompensed, far above the worth of his small deserts, by his honour's gracious approbation of his year's service in Italy. Is returning by way of Hamburg, and hopes to be in England by the end of May.—Venice, 29 April, stilo novo, 1588. The Duke of Arscott arrived yesterday, but with no other man of account and only four servants. He goes from hence to Loretto and so to Rome. "He shall be feasted this day of the Flemings at Muran[o], at the Spanish Consul's house; but there is no speech that the Signory will give him any extraordinary entertainment. Has been in bed for ten days with a fever. Asks for a passport for the Duchess of Angoulesme to transport four geldings into France.—London, 20 April, 1588. Bellievre and La Guiche are returned from those of the League, and report to the King that they received but slight and jesting answers. The Dukes of Guise and Mayne refuse to come both to the meeting, alleging the need for one of them to stay upon the frontier, by reason of the levy made by the Almains. De Mayne seems weary of the war, but Guise and d'Aumale, being ambitious and in desperate state, are constrained to keep themselves in arms. Guise pretends two causes of discontent; the dispossessing of Brissac from the charge of the castle of Angers and the removing of the captain of the citadel of Valence. Cardinal Bourbon is gone towards those of the League, and promises "to win them to draw their forces out of Picardy, or otherwise he will forsake them. D'Espernon offers to resign his colonelship of the footmen, "because it is grudged at that he hath so many offices," but keeps the placing and appointing of officers, so that all the infantry remains at his devotion. Duke Casimir has motioned a match between the young Elector and the daughter of the late Duke of Bouillon. The Count of Soissons had mass said at Pau, but the ministers caused some present at it to be imprisoned; who are come to complain to the King. Bellievre and Pinard proposed in Council "that it was most necessary for the realm to have a peace; but Queen Mother and others objected many difficulties therein, whereat the King was much offended, and went away in great choler. M. de L'Aubespine Chasteauneuf to Walsingham. According to a letter received yesterday from France, the King's agent in Spain writes that the King of Spain had announced his departure from Madrid to Lisbon, in order to dispatch his fleet; which, as they published, was to set out on the 8th of May at the latest, to come hither. The said agent writes—as a man conversant with that court—that he supposes this report is spread on purpose to be published in France and here; and does not believe that the army will be ready so soon nor that the King is going to Lisbon. Thought he ought to inform his honour of this, and sends him a letter from M. de Lanssac which he prays him to show to her Majesty, whereby she will see how much he is her humble servant.—London, 3 May. M. de Lanssac to M. de Chasteauneuf. Postscript. Begs to be commended to the Lord Treasurer and Monsicur 'Hauvourt' the Admiral. I send your honour what M. de Reaux brought to the King, both about the Prince of Conde's death and him that should have killed the King of Navarre. He has now taken leave and is departing. "Touching the Prince's death he demanded that the page (who was the minister of it) might be delivered, that justice might be done of him. The King answered him that he would do anything he could to punish them that were guilty of it. As for the page, he did not hear what was become of him, but if they could learn where he were, he would see justice should be done of him; and if his [the Prince's] wife were guilty of it, she should have justice. But he did not demand of the King to have any one sent down to look into the process, as it was thought he would. "Touching the other, that should have killed the King of Navarre, he desired the King . . . to appoint some gentlemen there in the country to assist with the King of Navarre's provost at the making of his process. The King answered that he did not think it reasonable nor honourable for him to send anyone to assist the King of Navarre's provost at it; but if the King of Navarre would send him either to the Marshal of Matignon or to the court of the parliament of Bordeaux, he did assure him he should have justice; or else, if he would deliver him to be sent hither, he himself would hear his examination and see him punished according to his merits; that the world might not think it were a thing forced out of him contrary to the truth. "Monsieur d'Espernon is departed towards Normandy and is thought will arrive at Rouen tomorrow. There are many here (who like not that he should plant himself there) have gone about to persuade the King to call him back again, putting many fears into his head of the troubles that are like to arise upon his arrival there; but they have not prevailed. "Here is nothing come of their treating at Soissons. It was said that Monsieur de Bellievre should return this day; but he hath sent one secretly from thence with a billet, and writes that he is stayed there, and not stayed [sic]; which is thought to proceed of the rumour that was given out that the King would do justice of the authors of these last broils that were towards; for so he was determined; but he is not now so earnest as he was. "That which I sent your honour of the enterprises of Sedan and Jametz are confirmed since to be true, and to be more than that which I writ. Here is a speech that M. de Montpensier and the Marshal d'Aumont will go to Sedan, but it is not certain, neither do they know whether they of Sedan will receive them in when they come." It is written from Rome that they now thought the army of Spain would go towards Algiers. There is nothing fresh from Spain. "The King keeps his Swisses still here about the town, with some other forces, though all stirs be pacified. "Some say that the Duke of Guise will come hither and they are making some little provision for him at his house; but for all that I believe it not. The League (though some here hold it up all they can), was never so bare, neither hath any one of them almost a penny. The clergy is their only support here, and doth keep the towns in liking with them, and withdraws them all they can from the King." I have seen by letters, and M. Pinard also told me that our Commissioners had met and conferred with the Duke of Parma in tents near Ostend.—Paris, 23 April, 1588. The night before last a courier came from Spain to the ambassador, with a packet to be sent away with all diligence to the Prince of Parma. What it contained the ambassador cannot tell (whereat he is very angry). He had only one letter in the packet, by which they advertise him that the Lisbon fleet will meet that of Biscay and Galicia on May 15 by their account; that the whole will be near two hundred sail, small, great and for carriages; that they have aboard near 20000 persons, with soldiers and mariners, "comprehending an hundred and fifty religious men. "That all this is for England. That they mean to take some place upon the sea coast fit to fortify. That the most they fear is to be charged with horsemen at their first landing." This is the contents of the ambassador's letter; whether of purpose written that he may give it out, or whether it be a truth I know not; but he does not hide it, and so it may be only a policy. He sent this morning for my Lords of Westmoreland and Paget, Charles Paget, Morgan and D. Wendooe [Dr. Nicholas Wendon] and told them "they must now pray and make themselves ready, for ere long now they should be restored into their country and goods . . . and [must] go down the best appointed they could to the Prince of Parma, and attend a good hour. And particularly told my lord of Westmoreland that his master (he hoped) ere many months would set him in the same estate and better in his own country than ever he was. He answered he should be beholding to him when he were in it, for so great a good, but for preparing himself without means he could not do that which he had a good will to do, as my Lord Paget there and others had, that had made banks afore they came and were well stored to do it. The ambassador neither did offer him means nor did answer him a word, but took my lord Paget, Charles Paget and Throckmorton and Morgan aside, and talked with them earnestly a great while; which doth make me to conceive that he meaneth rather to give out these things than for a truth, or else he would have offered my lord of Westmoreland some means, upon so near a pinch and so near an execution in England. "They all dined with him. After dinner, they went away all together, and desired my lord of Westmoreland to go with them, . . . to my Lord Paget's lodging, where they were in the greatest jollity in the world; my Lord Paget telling my lord of Westmoreland than upon the new news they had, that he should not want of any reasonable thing he could furnish him. "They began to give out hard words of the Bishop of Glasgow and the King of Scots, who they say upon his letters beginneth to fear this too great army of Spain to put footing in their realm, lest they should be more than quarter-masters in their country; that they are afraid lest the Scots will play (as they term it) a Scottish trick, and be glad to compound with the Queen. "Notwithstanding this, the Earl Morton and Simpell, who departed secretly from this town, as I have afore written to you, . . . are embarked at Dunkirk on Sunday was fortnight for Scotland, with letters to the King and divers of the nobility; the said Morton having assured to put certain havens upon the west of Scotland into the Spaniards' hands for their landing when they come, and to make a great party there to assist them. "That at his coming home, all possible means shall be done to make Liddington the chancellor away, because he is altogether of the Queen's faction. "That young Bettan [Beaton], the Bishop of Glasgow's kinsman is new arrived out of Scotland hither, who doth bring word that there will be shortly a change in Scotland. "That the Earl Huntley, 'Crayford' and others that are Catholic in heart are now in court, and in favour with the King. "My lord Paget, Charles Paget, both Throgmortons (the younger of the which hath by this last dispatch a pension granted of forty crowns a month) and Morgan, presently sent for their tailor to make them apparel and to put themselves in equipage. "They give out in their secret Council that the army doth mean to go about the north-west of Ireland, as far from Drake as they can, and not to meet with him if they can choose; and mean to land about Cockermouth. That they look for certain horsemen out of Scotland and a good party in the north; besides intelligences which they do assure themselves of; that they have by Allen the Cardinal's means in Lancashire. "Morgan and Paget have still letters out of England of the chiefest things that pass; and by them and other means the Spanish ambassador hath, he is assured, and doth, upon that, assure it into Spain, that Sir Francis Drake hath not threescore sail in all, and my Lord Admiral a good many less. "The French agent in Spain hath made a dispatch hither the day before yesterday, by the which he writeth that the army doth make account to be ready the fifteenth of May to join altogether; that still they give it out for England, but he is of opinion a good part of it shall go for the Indias, both because it is most necessary for him to send thither, to have a return, as also that they give out that they have discovered a new country, more rich in gold and silver than any they have yet found; but so full of stout people that they cannot master them. That the King of Spain is very well. "They give out here (but they give out so many tales that there is almost nothing to be believed but that which a man seeth) that there is a Frenchman among the Moors which they call le mignon Francoys, that they make a great account of; and that there are up in arms already 12000 Moors, and that their number increaseth daily. "There are some returned from Frankfort fair; and among the rest, Batista de Puis, who doth assure of a great levy in Germany, but taketh it to be for the defence of themselves, to the number in all parts of 15000 reisters. "He telleth me that he knoweth for certainty (and that the Chancellor of 'Hedelberg', he passing that way, did not deny it unto him, but marvelled where he had it) that there is sent into England out of Germany unto her Majesty a gentleman and a doctor very secretly . . . That the princes hold an assembly at Hambourg, where the King of Denmark shall meet with them. That the Duke of Saxony taketh our confession and doth put from him the Ubiquetaries. "That at Hedelberg they have certain news that Tassis and three hundred Spaniards are slain afore Bonne. "That the Polonian crowned King [Sigismond of Sweden] is a wise and a mighty prince, and that Maximilian being prisoner and sick, the Chancellor retired him into his house; where his wife being brought a-bed, Maximilian did, at his request christen [i.e. stand godfather to] his child. Upon this they made, I think, a bruit to run here . . . that the King of 'Suedland' was dead and that his son was run away out of Poland to take possession of his kingdom; and that thereupon, in spite, the Chancellor had set Maximilian out of prison and would crown him King.—Paris, 24 April, 1588. "This bearer is a friend's son of yours, who, being brought up with my Lord of Pembroke, and from thence sent for to be with the King of Navarre by his father, hath been ever since with me; his father being for his religion in that poor estate at Sedan that he hath enough to do to find himself and his poor family. He is now (being not able to pass to the King of Navarre, and my lord of Pembroke having written that he would be very glad he should return unto him) to return thither" and having letters from his father and from Mademoiselle of Bouillon (fn. 1) for her Majesty, your honour and others, I have given him this packet and pray you to be good to him for his father's sake.— Paris, 25 April, 1588. Passport from the King of Navarre for the sieurs Joachim and Jacques Bellue, brothers, together with their agents, ships, merchandise and mariners, going from Rouen and the coast of Normandy to 'Marceylle' and to Alarache, Fez and Morocco, in the ship named the [blank], laden with merchandise; both for going and returning, to be allowed to pass without any trouble or hindrance, either to the persons, ships or merchandise, but rather to be given all favour and assistance of which they may stand in need. Offering, in like case, to do the same.—La Rochelle, 6 May, 1587 [sic]. "For all the cunning that Queen Mother hath used to make the King afraid of M. d'Epernon's danger, if he did not call him back out of Normandy, by reason, as she said, that M. d'Aumale and d'Elbœuf are there, and assemble forces to trouble and impeach him, he would not be persuaded unto it, but still will have him go forward, and this day, I think he maketh his entry into Rouen. It is hoped that the King, discovering they have gone about to make him afraid in this of forces in the air, and finding in it their inability to perform anything, will not so easily be made afraid . . . hereafter." "If Epernon get Newhaven into his hands, as it is hoped he will . . . and by that means do stablish Normandy, it is a shrewd blow for them as any they had a good while. . . .
"M. Bellievre is marvellously discontented of this last stay that they have made of him, under the colour of cunning making him to dislodge out of the faubourgs of Soissons to come into the town; and hath spoken very roundly and plainly to the Duke of Guise; whereat at the first the Duke answered him very highly and impudently; but as I hear, the other hath replied so unto him that he speaketh mildlier a great deal than he did, and upon that, it is certainly expected that M. Bellievre will be here tomorrow or the next day at the farthest . . . The chiefs of the League "have not a penny from hand to mouth." M. d'Aumale's receiver general is trying at this hour to borrow a thousand crowns here, and cannot get it. He has declared that M. d'Aumale "hath neither house, land nor cottage but is engaged for as much as it [is] worth; that they receive not one penny of all their living and that if they had laid down arms, they must needs starve." The King went yesterday to the Bois de Vincennes and forbids anybody to trouble him there, as he means to be at rest and purge himself. I hope we shall see ere long some better effects. "The Ambassador's wife hath served Villeroy's turn, who is mortal enemy unto Pinart, to put into Queen Mother's head some jealous conceit of Pinart, and goeth about by that means also to have Pinart's son's going into Scotland coverted to some that Villeroy would appoint; and indeed his journey is stayed, but without doubt it will not be broken, I think. Pinart is upon this, marvellously animated against Villeroy" and though he dare not show it, if he can cross him, he will. He is also daily "more and more animated against the League, at these stirs that should have been which I writ to you of in my last. In a roll that was brought to the King, Pinart was the fifth man in it that should have been dispatched. It maketh him more affectionate than he was. "Queen Mother's comb is almost cut with Epernon's going, and that no cunning would call him back. She is afraid that the King will discover her art.—Paris, 27 April, 1588. J. de Castro to Walsingham. The revolution of the times would, it seems, have him honour this day for ever, since it commits to his hands the enterprise for his fatherland, wherein he serves both the most Serene Queen and that realm by means of his most illustrious lordship. The glorious fame which her Majesty has throughout the world inspirits him to believe that nothing can greatly affright so lofty and rare a princess in pursueing such an enterprise, seeing that she has great natural parts, a most flourishing realm, large forces by sea and land; vessels and wealth. And that is not all; for the chief felicity of her realms consists in her supreme council, whence is derived a reputation so high that the enemy's dread thereof is as great as that of all others for him; to which is joined the renown of his most illustrious lordship, whose praises fill the mouths of men, strangers though they be. For himself he is called Dom Joam de Castro, of one of the chief noble families of Portugal; being one of the four gentlemen who, in May of last year, desiring no longer to serve Don Antonio, left England and came hither into France (he not being nominated for King, since he judged himself to be unworthy of so lofty a designation) when they would rather have put all to the hazard than incurred what followed: to wit that the said gentleman excused himself from accompanying them, not to mention many private grievances which he had against them. It is grievous to see that they can go forth for the freedom of the fatherland only with infamy and eternal dishonour of the royal house of Portugal, and humiliation of the name of Portuguese, for love whereof they desire rather contempt, dishonour, death, banishment, hunger, thirst, nakedness; for when all is said, it is the same fatherland, though not possessed by a native Portuguese King; and they will not be deterred by his shameful behaviour and dealing with factions discovered in that kingdom [England] or in Portugal. And for the discharge of what they have honourably done, he refers the whole matter to his lordship, without desiring more credit than he can claim for the success of the past, justice and reason and the success of the present; he [Antonio] preferring to be the vassal of the King of Castile and to abandon himself to his enemy, renouncing the hope—by the aid of Her Majesty—of coming to be as fortunate and honoured as were his forefathers, and it seeming that the planet of his father, the Infant Dom Luis, does not influence him in this his last quarrel. For he has sold himself to the King of Castile and made an accord with him and is now leaving that kingdom [England] without any ceremony [shown] to the most serene Queen, understanding so ill the sovereign protection which he has had there, and the false estimate he is making of the strength of his enemies. And since King Philip is so much the enemy of that realm and of her Majesty more than all, as is shown by his designs and the rumours of Armadas, wherewith perhaps rather to menace her than to attack in strength; assuming that the English forces are a match for him; it would be better not to keep them stationary, but that they should go and attack the enemy at home . . . And since the King has made peace with Dom Antonio, he may perhaps begin to withdraw his forces from thence. It may be that he will have the signed agreement published, for the sake of his reputation with the world, and thinking thereby to crush the hearts of the Portuguese; disabusing them of any hopes they may still have by showing them that he whom they sought for their defender and liberator has gone to surrender himself and crave for mercy; seeing that the princes in those parts had devised no help, nor was any lord powerful enough to endeavour his restoration; which could not fail to have great effect in breaking their spirits and causing them to retire; as the writer believes by the little knowledge he has of the lords of those parts and of the ill-government, poor spirit and great incapacity of Dom Antonio, which makes him unable to restore and preserve himself in power; as befel him in Portugal in all the time of King Dom Sebastian, of the Queen, Donna Caterina and of the Cardinal King Dom Henry. . . . . .
And if (returning to the former subject) King Philip, instead of publishing the agreement, should remain quiet; yet he will still have the said gentleman in his power, or could give him up on terms which may be considered already attained, seeing the humour of the Portuguese, who deem the matter to be already settled; making account of him [the King of Spain] as their head, and having no fear of Dom Antonio, since he has neither parts nor power, more than as a sort of corsair—with which [life?] he was better pleased than with the rule of those parts—united to the odium in which he is held, and the determination of those of that kingdom to compass his ruin, as was shown by the rising in 1584 . . . .
Wherefore, since Don Antonio is already for the King of Castile, and is at heart his vassal; in what he today promises and affirms, he is not to be believed. If the most gracious Queen desires to aid some gentleman of Portugal to liberate that realm, the writer pledges her his word to do her a notable service, and one of great consequence to her realm, by embarrassing the enemy in Portugal; and never can that country better effect its liberty than now. . . . . And if this seems good to her Most Serene Majesty and to his illustrious lordship, he will with as much speed as possible (for at the commencement of this business, speed is the most important thing of all) betake himself to Portugal; so getting the better, in point of time, both of the enemy and of Don Antonio; that they may not send someone first to cheat the people with inventions, as is their custom, . . . whereby such an enterprise would be subject to much prejudice, if not prevented by diligence . . . But as they must go each one in his own way to this end; and have no possibility of moving in their favour the lord of that realm . . . . they will not be able to undertake the enterprise without the aid of the most serene Queen . . . . yet with two hundred crowns he would keep his word, and they would do that realm good service against the enemy, and there will be seen by this very paucity [that they are led the rather by] the desire of enterprise than the greed for money. In England he did not in person treat of this business; thinking it not to be convenient; there being much suspicion on the part of every great personage upon his recent arrival; wherefore he resolved thus to act [sic] in the absence of Dom Antonio de Meneses; a very illustrious hidalgo of that realm, as is known to all the world; for in their desires to serve her most gracious Majesty; in love of the fatherland, and in courage and fitness for the enterprise, not only is he as good as the writer but better, if such a one there can be, and is going, on his part, to do service of another sort in that realm, and to offer for her more than he professes—even his blood. . . . . .
Is staying in Paris, in the fauburg of St. Germain, outside the Porte de Bussi, in the house of an apothocary, by name Monsieur Foge; and is now hastening with this letter to Mr. Haquin [i.e. Hawkins, but should be Hakluyt] the minister and secretary of her Majesty's ambassador . . .—Paris, 7 May, 1588. Recommending to her favour the bearer, Martin Ganser, a citizen of Nuremberg. The matter which takes him to England proceeds entirely from his good will and affection to Thomas Neucklin and Rudolff Burnet, factors for Robert Barmby, a citizen of London; to furnish whom with 14000 florins he not only employed all his means but borrowed money and became answerable for them in the said town of Nurnberg; which he has been obliged to leave for lack of means to satisfy the debt, after seeing the said Neucklin and Burnet secretly withdraw from the town, without repaying or discharging him for what he had furnished and borrowed. And for this cause, he must absent himself from his house, with his wife and four children, good citizen and comfortable as he was, and fall into poverty, as he will more amply explain to her Majesty if she will be pleased to listen to him. Implores her to do so, being assured that when she hears how he has been treated she will grant his humble prayer; which is that he may be paid with prompt justice; having regard to the ruin into which he has fallen by obliging her subjects.—Heydelburg, 28 April, 1588. Sees by their dates that the letters sent him have been detained a fortnight in Paris. Believes that Mr. Stafford will have sent his honour all that has been said as to the attempt upon the life of the King of Navarre. God has miraculously delivered him. His Majesty writes that he has given charge to M. du Plessis to advertise him of all the details, but du Plessis' letters have not yet arrived. Almost thinks it to be due to mistaken deciphering of the said letters that they have sent his honour word that he was ill spoken of therein, and hopes he will learn the truth. Prays him to grant an interview to the Sieur de Cœdor, who has business with the Admiral, and desires his mediation and favour.—London, 29 April, 1588. Bellievre returned on Saturday, (fn. 2) "marvellous evil contented with the Duke of Guise's manner of dealing with him, and did plainly tell the King that he could in few words express to him all that he had gathered; which was that either he must determine to give them that which was not fit for a King to grant— which is all that they asked—or else to show himself a King and to make them to know him so. Whereupon the King grew into a great choler and told his mother that they might see what her delays and expectations came unto. That he would take another course. And so went his way, but in a great choler. "The next morning he came to Queen Mother again, and there he plainly resolved to seek all the help of his friends, and to hazard all rather than to be in this state he was in; and put his mother in remembrance of the advice your Majesty gave him; that there was no remedy but he would follow it. His mother answered him again, that which she had counselled him she had done it for the best, as she thought; but that she could not now advise him to any other course than that which were fit, for that she must be of his mind to; but that if first he would send M Bellievre again to them, to deal plainly with them and offer them what he thought reason, and if they did not accept of it and acknowledge their duties, that then nobody should be readier to further any course against them than she; and that if this did any good, that she stood still in that mind that [it were] better to yield a little more than was reason, than (as things and this state stood) to hazard things with too great promptitude and to put them to desperation. "This the whole Council advised the King to follow, whereupon he agreed unto it once more, with protestation never to send more, but to take a new course. Bellievre kneeling down upon one of his knees to the King, humbly beseeched him that another might be sent to them, that he might go no more, for that it was not possible for a true and faithful servant of the King's to go and hear them speak so insolently. Yet the King's will was he should go for the last time, and so was resolved that this day in the afternoon he should be dispatched and go to Domartin to bed and to carry this resolute message. "I can assure your Majesty that the Council was not so soon broken and the King gone out, but Queen Mother dispatched in all posthaste to the Duke of Guise to advise him by all means to speak gently to Monsieur Bellievre and to agree to anything, and if the Duke would believe her counsel, he should presently, this dispatch received, redispatch one hither with all diligence to take knowledge of these bruits and alarms that they give the King of him in this town and to offer thereupon all humility to the King, to show him that how evil soever he hath been used, he will rather be undone than the King should have cause to conceive anything against him, and that if he did come himself and use those speeches to the King, she durst warrant it, would turn but to his good. And if he did resolve upon the last, if he met M. Bellievre by the way, to turn him back again with him hither, if he did but send to do it with that speed that the bearer might be here by this day at noon, afore Bellievre parted, which might easily [be] done, being but twenty leagues between this and Soissons. "This for fear the King should not know, myself found means to let him know, which he thanked me greatly for, but he said he knew it afore and bid (fn. 3) [?] let him alone. "All this, I beseech your Majesty, may be kept very secret, for else all must needs be bewrayed from whence it cometh, and I shall undo them, and be frustrate of the like for your Majesty's service hereafter. I leave your Majesty, for troubling you, to the rehearsal of the rest of our late bruits and alarms here to the letter I write to Mr. Secretary." "Thus I commit your lordship to the keeping of God. "—Paris, 29th April, 1588. Copy by Stafford himself, sent to Burghley. At the head of the letter is written "My very good lord, this copy following and Mr. Secretary's letters will make me not long at this time." "After I had closed up my dispatch and sent it to one that went to Rouen, to be delivered to this bearer, who was there tarrying, according to my commandment, to see what Epernon did, I went to the 'lover' [Louvre] to go to the Council, where I was appointed about an English merchant's cause, having hour at two of the clock. I met upon Notre Dame 'brigge' one coming to me from a friend of mine to advertise me that at the same instant that he sent him, the Duke of Guise was arrived and lighted at the Queen Mother's house, only with twelve horse. I left "Mr" for that to go forward to the 'Louver', where I found all the guards in [ar]ray, posting about to send for the Swissers and to have everybody in a readiness. "I went in and sent the Chancellor [Chiverny] word, who was with the King, that though I had come thither by their appointment, seeing a new accident come, if it pleased them, I would come another day. He came out to me himself; [said] that they thanked me [but] that with all their hearts, they would sit and not give me pains to return, if I would, but that this accident happening, if it pleased me, they would take what day I would appoint; so I offering them to take their opportunity, I went my way; and by the way found all the gentlemen coming in at the lower gate by flocks, and all the world in a murmur, and Swisses and soldiers coming that way from all places and met at the gate. Bellievre, booted, coming in to the King from the Queen Mother, I asked him if he was so soon come home. He shook 'the head' very soberly and told me that he that he went to was come unlooked for, and so went by in haste to the King. I left one of mine behind to follow him all the day and to see what became of him; and sent another to the Queen Mother's to see what was done there; and myself came home, and sent to see if he that carried the packet to Rouen (Roan) were not gone, to send it me again; and finding that he parted not till morning, thought good to add this to the packet. "My men returning brought me word that Bellievre, as soon as he had been with the King, not tarrying above a quarter of an hour there, went again to the Queen Mother's; and presently after his coming, the Queen Mother, not being able to go [i.e. walk] was carried in a chair, and the Duke of Guise afoot by her, went to the 'Lover', where at the entry, nobody in the world saluted the Duke; went up the back stairs to the Queen regnant's lodging, and at the entry, everybody forbidden to enter but the Duke, Bellievre and the Queen Mother; where the King and they stayed three hours and the Duke of Guise came down alone the back way and nobody with him, and went to the hostel of Guise, with those few that came with him that stayed in the court; and at his going out, nobody offered to come to him to salute him. "There are, above all the guards, four hundred Swissers sent for and be gone to the 'Lover'; the rest in arms in the faubourgs, and all the captains of the town commanded to watch and ward. "They speak diversely of his coming, and Queen Mother made it strange to see him. God save us all. In haste. 4000 lansquenets and 1000 horse, levied by Marquis Charles at 'Inspruck', have passed by Freiburg to go into Flanders. In February last there were also levied 3000 foot and 300 horse, to be employed into Poland for Maximilian, but that enterprise being broke they are to be sent into Flanders. May 4, stilo novo, sundry waggons, laden with armour were sent from Insp[ruck] into Flanders. Also 40 horses laden with barrels of harquebusses, made in Milan. There are levies generally made throughout Germany, said to be for Poland, but they pass up toward 'Augusta' [Augsburg] and Bavaria. "The levies which Casimir is said to make are nothing so gr[eat] as they have been given forth; for he seemeth in manner not to stir." 1. See p. 593 above. 3. The symbols read b, m, d.